Father and Son team successfully! 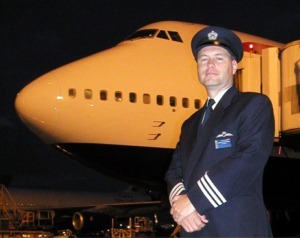 Brian Whittaker, a Boeing 747-400 pilot, climbed 19,330 ft. Mt. Kilimanjaro with his retired father, John, in March 2004. 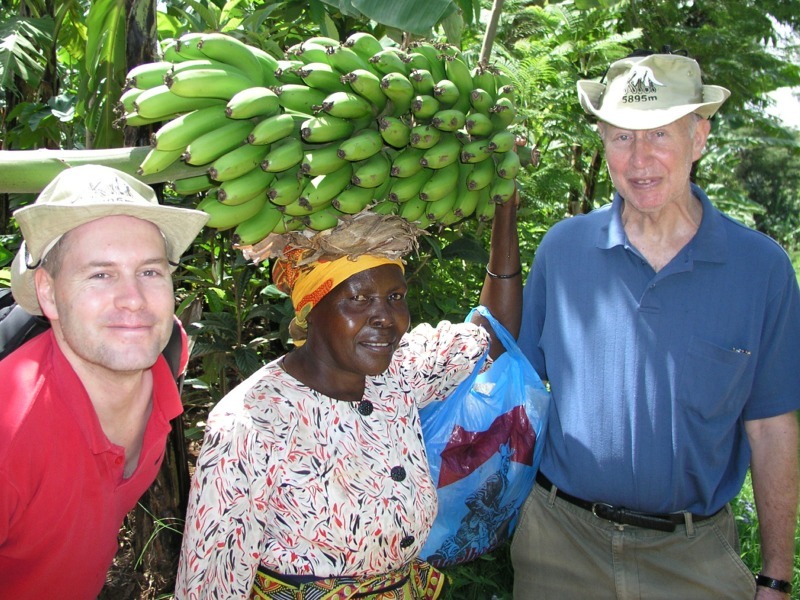 It was all to support KVEP [more], a charity benefiting local Tanzanian villages on the south-east flanks of Africa's tallest mountain [map]. 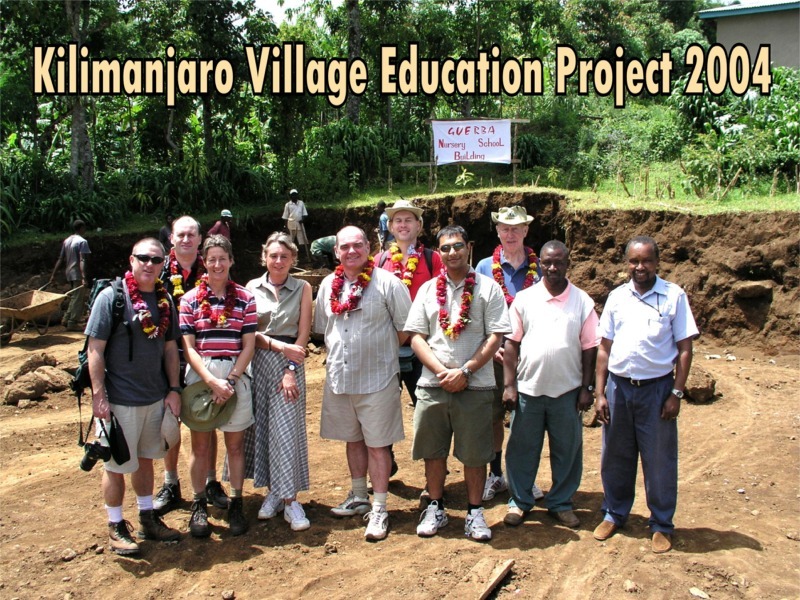 The Kilimanjaro Village Education Project (KVEP) is building a "Nursery" from the monies raised during this single trek to the summit. 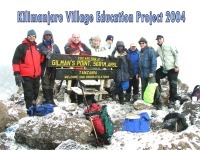 Altogether a team of 8 climbers contributed in excess of their single minimum contribution of £2200 GBP each. Brian raised money by receiving donations for a limited-production prototype CD containing interesting aviation scenes and images. He also participated in a 40 pound weight loss pledge [weight]. My collections have concluded. Thank you for your donations. We did it! 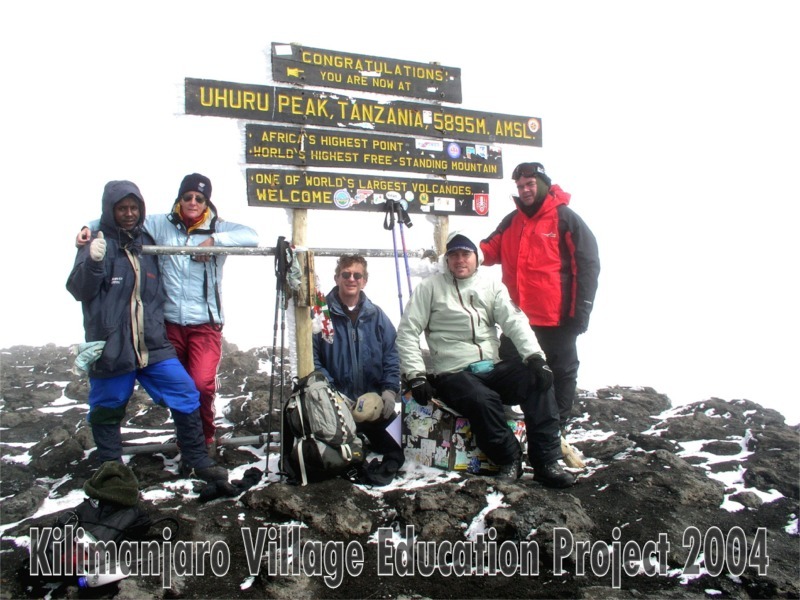 Our group raised enough money to build the Nursery and we triumphantly climbed Mount Kilimanjaro. Two amazing objectives, about a year in the planning, completed all thanks to your help and support. Thank you. 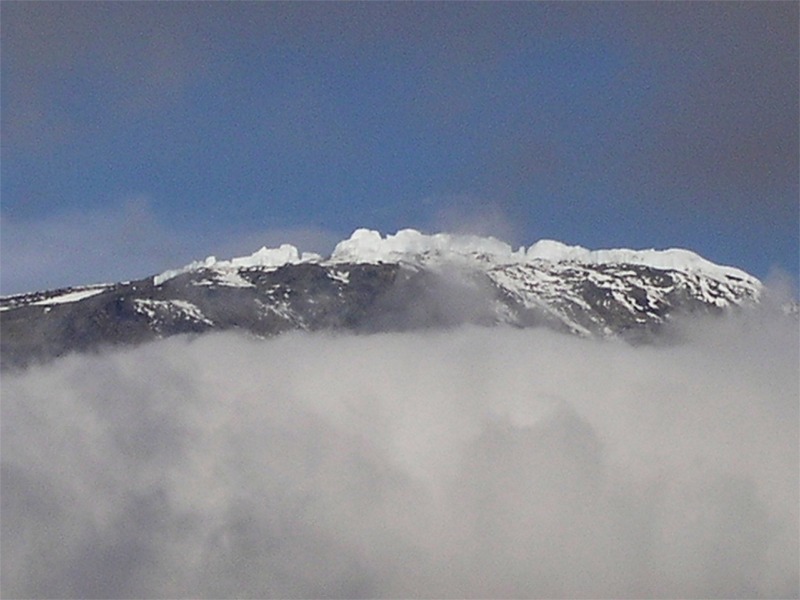 From the beginning we could see Mount Kilimanjaro standing proud at 19,330 feet (5895m) as Africa’s highest mountain and our new challenge. It’s difficult to judge the true size of a mountain that defies common perspective, but soon we would fully appreciate its enormity. The distant specks of snow on the narrowing mountain summit visibly so far away, would soon become gigantic glaciers spread across a colossal plateau soaring almost 4 miles into the sky. Remember, that the base of this mountain is larger than the circumference of the M25 Motorway (outer ring road) circling beyond all of greater London, England. Soon our six-day trek would have us to the top and back, the group starting as metropolitan strangers and finishing as mountaineering comrades. We were slowly and willingly converted from our artificial, pampered ways by each night of new, tiring discomforts . The great outdoors allowed things to become simple and the extraneous responsibilities of urban life vanished. We ate, we slept, and we enjoyed each other’s conversation while walking closer to our goal. We also were spoiled on this trip, having a total of 25 porters and guides that made sure our trek was pleasurable. 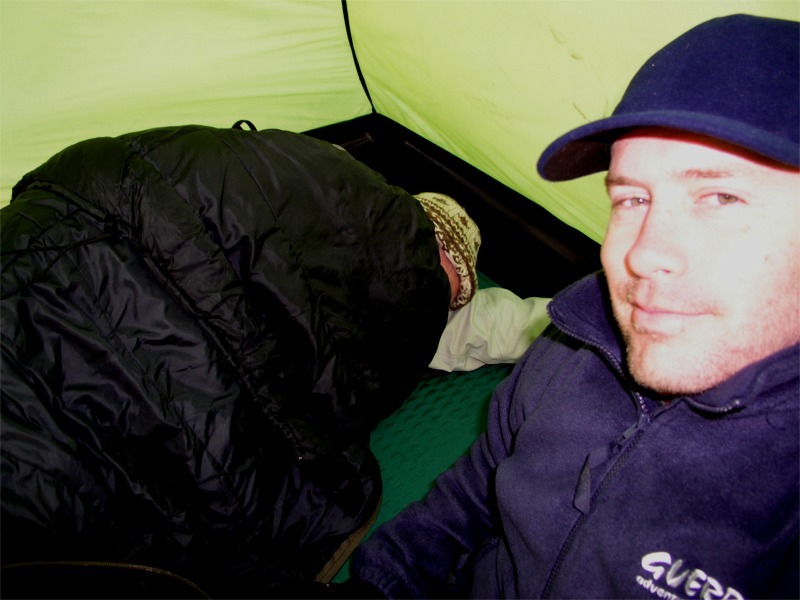 Words cannot express the joy of ending a day’s walk and finding your tent already up, a warm cup of tea in your hand, and the smell of dinner in the air. Guerba donated us a great trip! (more Guerba). All eight of us made it up to Kibo Hut (15418 feet, 4703m), only 341 feet shorter than the elevation of Europe’s highest peak, Mt Blanc. This is extremely high! 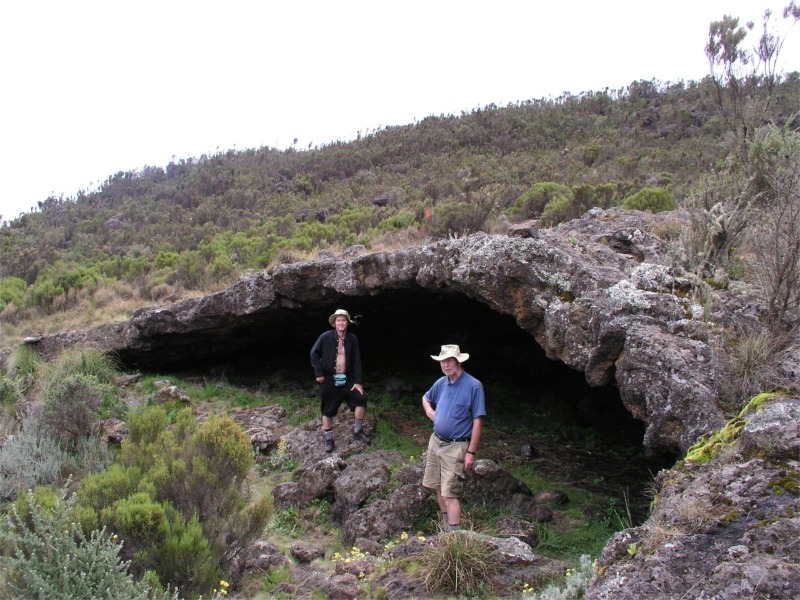 Of the seven that made it to the crater rim at Gillman’s Point, already well above both the Mt. 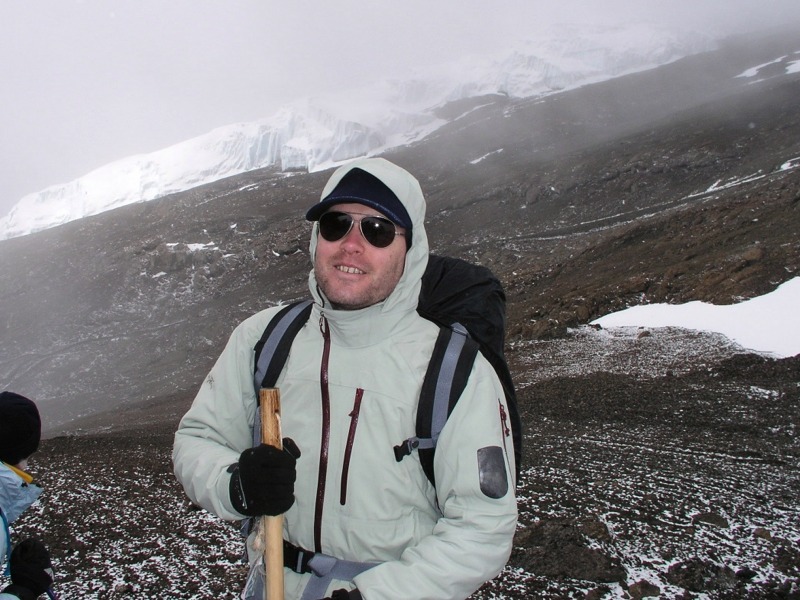 Kenya summit and the Everest Base Camp height, four (including me) went on to the actual Kilimanjaro summit, Uhuru Peak. 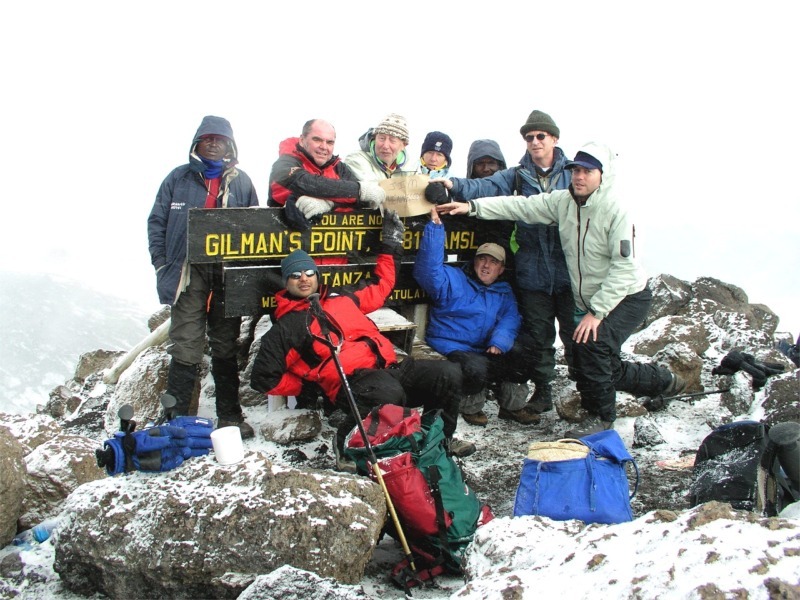 As a personal memento for Jim's gallant effort so close to Kilimanjaro's top, we all held a card showing his name (photo above left). 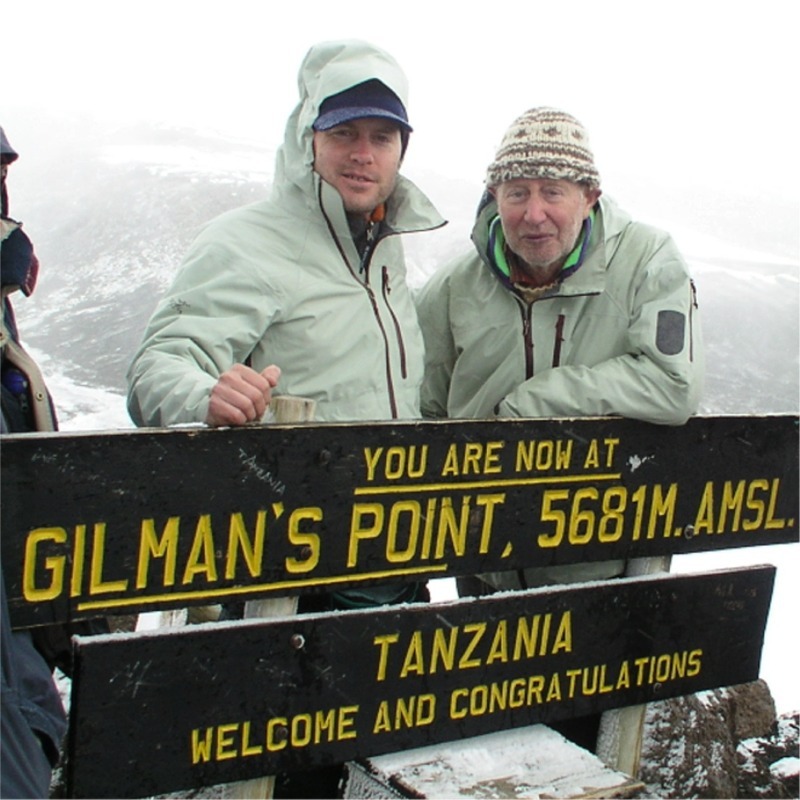 The climb will no doubt go down as one of our greatest accomplishments ever, and well worth the effort. 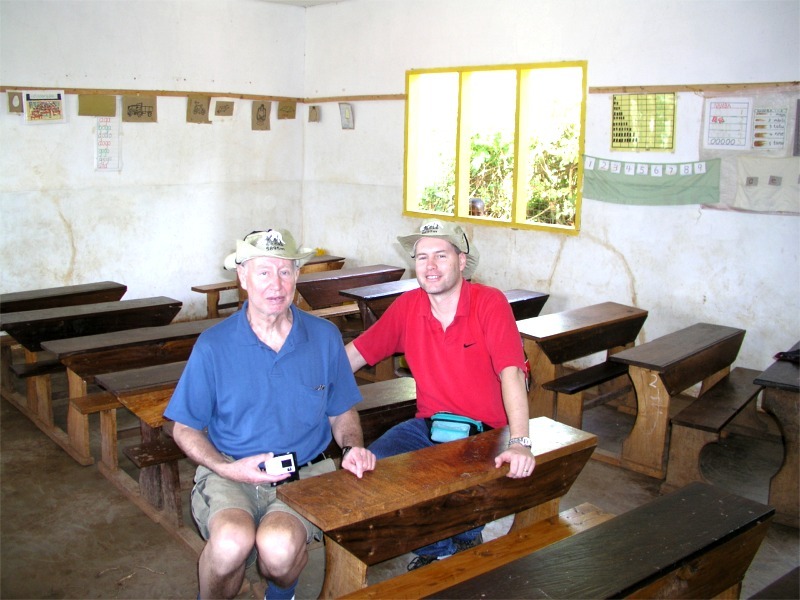 My Father and I had a wonderful time together. Please see our photos and text below (below). He started his trip from Victoria, BC, Canada and was lucky enough to be able to spend some additional time with my family in England. 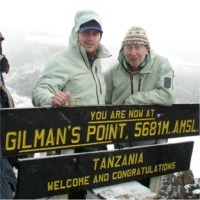 He has climbed many high peaks in the Rocky Mountains as recently as last year, but had realistically all but given up on the idea of climbing Kilimanjaro. I can only imagine that it’s everybody’s desire to climb this mountain, as it had always been a (now achieved) childhood dream of mine as well. Brian Whittaker, Participant, Charity Website and CD creator. I had a really really great trip with my Dad! 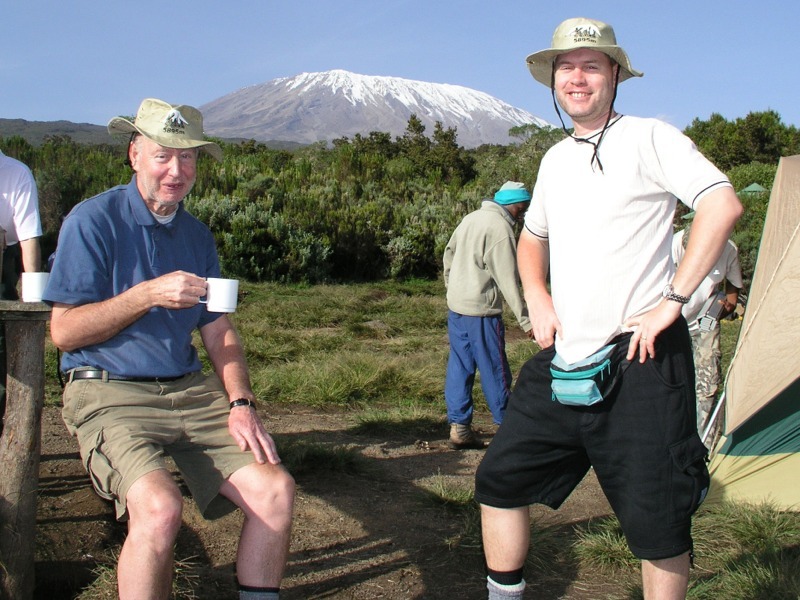 From flying him (as pilot) over to England from Canada in the jumbo, to standing on the top of the highest peak in Africa, to returning him safely to Mom in Victoria (as passengers) in a floatplane, this trip was one to remember. We both felt at home in this foreign land, with our feet on the cool mountainous terrain, while trekking our way up the slopes. 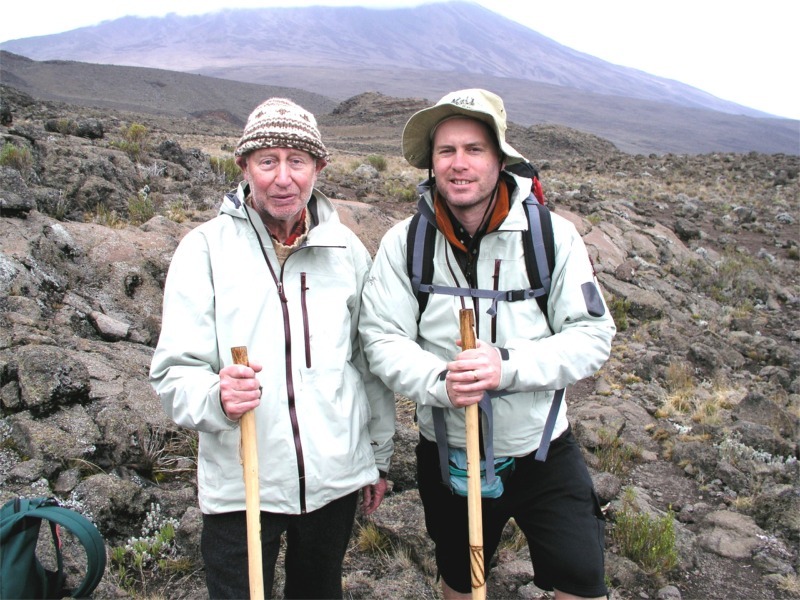 We also both shared an impending excitement of climbing our highest mountain, with thoughts filled with exploration and adventure. My Dad just loves climbing mountains. At age 65, it is the one place everyone knows he is happiest! I managed to capture one of his innocent adventurous grins on film (below). This is where my Dad becomes as happy as a schoolboy, a trait that he's managed to pass on to me. The realities of family, career, and the 7600 km between us now have meant that we no longer routinely do these activities. 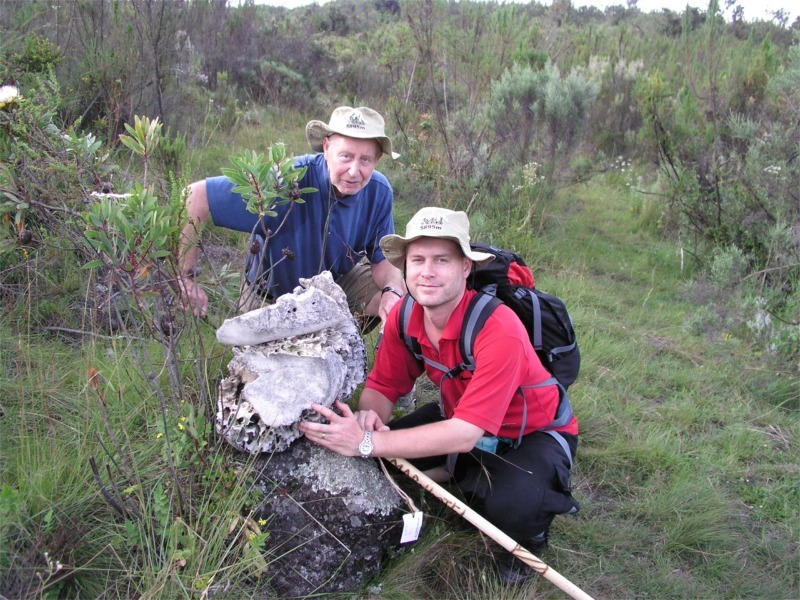 With hind sight, I can see that all our many hikes together have actually faded into many years gone past. 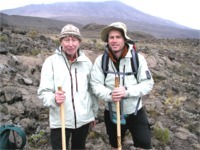 In fact, I realise that a lot of my fresh memories of hiking larger peaks with Dad are actually now old memories and quite distant, when I was a shorter, smaller, young child or teenager. This might help explain why I felt very happy and comfortable on this climb, as I had all the familiarities of the past, but was no longer the little straggler. 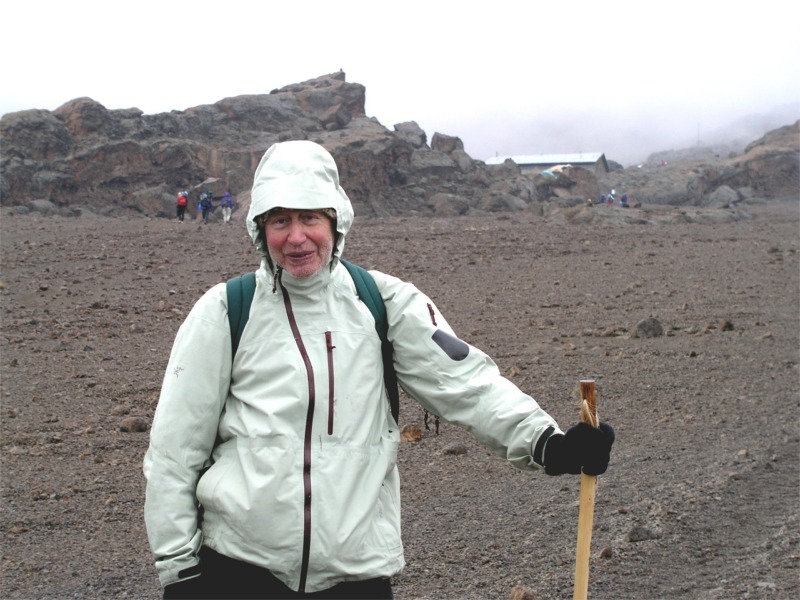 My Dad didn't quite make the extra little bit to the very top summit of Kilimanjaro that morning as I did, but he will be forever triumphant that he made the crater rim, the traditional "Top" with the Certificate to prove it. Congratulations Dad. Trip nickname "Babu". 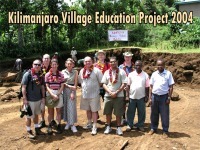 The Kilimanjaro Village Education Project has an KVEP Official Site with lots of information available. Some of their information pages have been erased with a recent website update, which sadly meant that I had to remove some 2002 and 2004 project hotlinks. Please see my "Interested?" 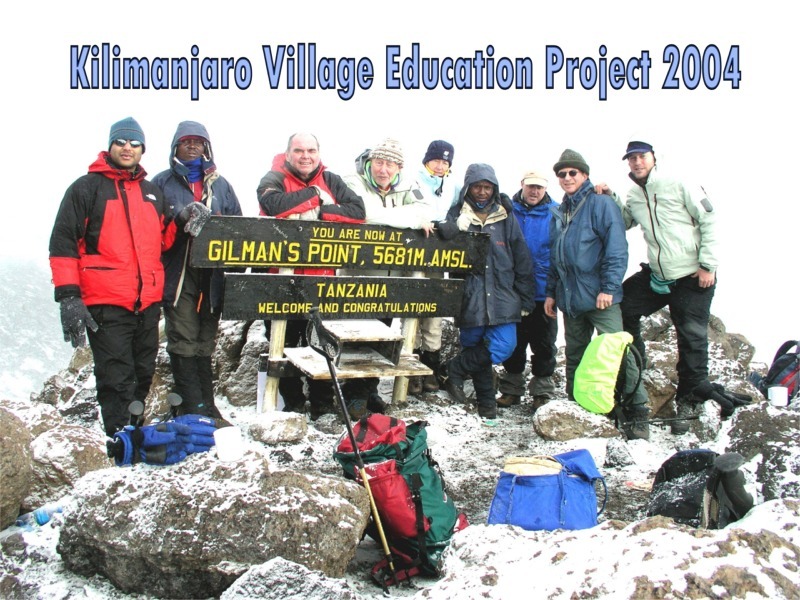 page [link] above for information on the 2005 Kilimanjaro fundraising event for Almani Children's Home. The sponsors, "Guerba, adventure & discovery holidays", also have a commercial website where their numerous adventure holidays are detailed.